Satellites have been put in space for various purposes and their placement in space and orbiting shapes have been determined as per their specific requirements. GEO (Geostationary Earth Orbit) at about 36,000km above the earth's surface. LEO (Low Earth Orbit) at about 500-1500km above the earth's surface. MEO (Medium Earth Orbit) or ICO (Intermediate Circular Orbit) at about 6000-20,000 km above the earth's surface. If a satellite should appear in fixed in the sky, it requires a period of 24 hours. Using the equation of distance earth and satellite, r = (g.r2 /2.r.f)2)1/3 and the period of 24 hours f = 1/24 h. the resulting distance is 35,786 km. the orbit must have an inclination of 0 degree. Geostationary satellites have a distance of almost 36,000 km to the earth. Examples are almost all TV and radio broadcast satellites, any weather satellites and satellites operating as backbones for the telephone network. Objects in GEO moves around the earth at the same speed as the earth rotates. This means geostationary satellites remain in the same position relative to the surface of earth. Three Geostationary satellites are enough for a complete coverage of almost any spot on earth. Receivers and senders can use fixed antenna positions, no adjusting is needed. GEOs are ideal for TV and radio broadcasting. Lifetime expectations for GEOs are rather high, at about 15 years. Geostationary satellites have a 24 hour view of a particular area. GEOs typically do not need handover due to the large footprints. GEOs don't exhibit any Doppler shift because the relative movement is zero. Northern or southern regions of the earth have more problems receiving these satellites due to the low elevation above latitude of 60 degree, i.e. larger antennas are needed in this case. Shading of the signals in cities due to high buildings and the low elevation further away from the equator limits transmission quality. The transmit power needed is relatively high (about 10 W) which causes problems for battery powered devices. These satellites can't be used for small mobile phones. The biggest problem for voice and also data communication is high latency of over 0.25s one way-retransmission schemes which are known from fixed networks fail. Transferring a GEO into orbit is very expensive. As LEOs circulate on a lower orbit, it is obvious that they exhibit a much shorter period (the typical duration of LEO periods are 95 to 120 minutes). Additionally, LEO systems try to ensure a high elevation for every spot on earth to provide a high quality communication link. Each LEO satellite will only be visible from the earth for about ten minutes. A further classification of LEOs into little LEOs with low bandwidth services (some 100 bit/s), big LEOs (some 1,000 bit/s) and broadband LEOs with plans reaching into the Mbits/s range can be found in Comparetto (1997). LEO satellites are much closer to earth than GEO satellites, ranging from 500 to 1,500 km above the surface. LEO satellites do not stay in fixed position relative to the surface, and are only visible for 15 to 20 minutes each pass. Using advanced compression schemes, transmission rates of about 2,400 bit/s can be enough for voice communication. LEOs even provide this bandwidth for mobile terminals with omni-directional antennas using low transmit power in the range of 1 W.
A LEO satellite smaller area of coverage is less of a waste of bandwidth. A LEO satellite's proximity to earth compared to a Geostationary satellite gives it a better signal strength and less of a time delay, which makes it better for point to point communication. Smaller footprints of LEOs allow for better frequency reuse, similar to the concepts used for cellular networks. The biggest problem of the LEO concept is the need for many satellites if global coverage is to be reached. The high number of satellites combined with the fast movement's results in a high complexity of the whole satellite system. The short time of visibility with a high elevation requires additional mechanism for connection handover between different satellites. One general problem of LEO is the short lifetime of about five to eight years due to atmospheric drag and radiation from the inner Van Allen belt. The low latency via a single LEO is only half of the story. Other factors are the need for routing of data packets from satellite to satellite (or several times from base stations to satellites and back) if a user wants to communicate around the world. A GEO typically does not need this type of routing, as senders and receivers are most likely in the same footprints. A MEO satellite situates in orbit somewhere between 6,000 km to 20,000 km above the earth's surface. MEO satellites are similar to LEO satellites in the context of functionality. MEO satellites are similar to LEO satellite in functionality. Medium earth orbit satellites are visible for much longer periods of time than LEO satellites usually between 2 to 8 hours. MEO satellites have a larger coverage area than Low Earth Orbit satellites. MEOs can be positioned somewhere between LEOs and GEOs, both in terms of their orbit and due to their advantages and disadvantages. Using orbits around 10,000km, the system only requires a dozen satellites which is more than a GEO system, but much less than a LEO system. These satellites move more slowly relative to the earth's rotation allowing a simpler system design (satellite periods are about six hours). Depending on the inclination, a MEO can cover larger populations, so requiring fewer handovers. A MEO satellite's longer duration of visibility and wider footprint means fewer satellites are needed in a MEO network than a LEO network. Again due to the larger distance to the earth, delay increases to about 70-80 ms. The satellites need higher transmit power and special antennas for smaller footprints. A MEO satellite's distance gives it a longer time delay and weaker signal than LEO satellite. The High Earth orbit satellite is the only non-circular orbit of the four types. 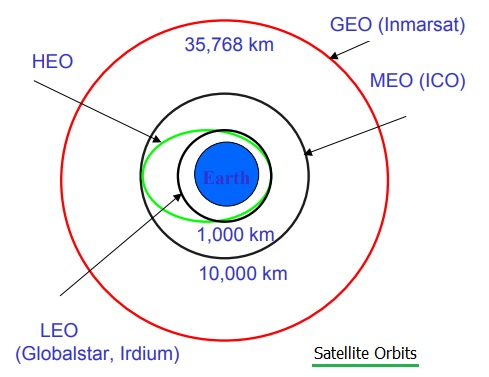 HEO satellite operates with an elliptical orbit, with a maximum altitude (apogee) similar to GEO, and a minimum altitude (perigee) similar to the LEO. The HEO satellites used for the special applications where coverage of high latitude locations is required.